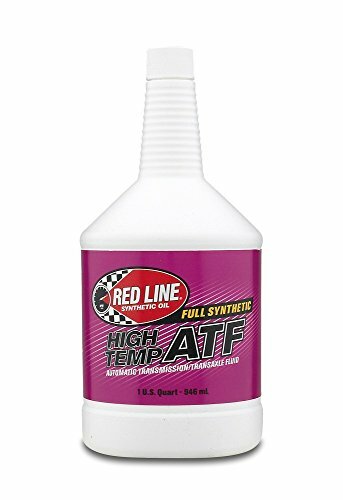 Red Line's High Temperature Automatic Transmission Fluid is a synthetic ATF which is a GL-4 gear oil for use where Dexron III or Mercon is recommended and is perfect for heavily-loaded vehicles. Its superior stability allows high-temperature operation without varnishing valves and clutches. Synthetic High-Temp ATF provides the gear protection of a GL-4 gear oil in an ATF and provides a higher viscosity at higher operating temperatures, allowing the transmission to operate at 70°F higher temperature and still provide the optimal shiftability and improved torque converter efficiency. The evaporation characteristics are significantly improved, being twice as good as our Synthetic ATF and five-times better than a petroleum ATF. The improved thermal stability significantly reduces the rapid evaporation of the ATF which can produce a frothing out the filler tube. The balanced frictional characteristics provides smooth and consistent shifts for extended drain intervals. The superior stability compared to petroleum ATFs allows high-temperature operation without varnishing valves and clutches which leads to transmission failure. This product can be used in manual transmissions which require ATFs and will provide much better gear protection than a petroleum ATF; however, MTL® will provide better wear protection and better low-temperature shiftability in most manual transmissions which call for an ATF. Improves shiftability and torque converter efficiency. If you have any questions about this product by Red Line Oil, contact us by completing and submitting the form below. If you are looking for a specif part number, please include it with your message.